Delhi: The Lava Smartphone Manufacturing company has launched its latest device at Rs. 7349 in India. It comes under the model of Lava X series. The smartphone had the feature of 4G support, and this phone has officially announced on the Lava website. The users can get the complete Lava X28 specifications there along with the price details. Here, it is a place to get the key features of the phone. The Lava X28 will be available in three different colors such as Gold, Silver, and Coffee. This New Lava 4G Smartphone will be available at all the multi-brand stores, Retail mobile phone channels, and online retails. 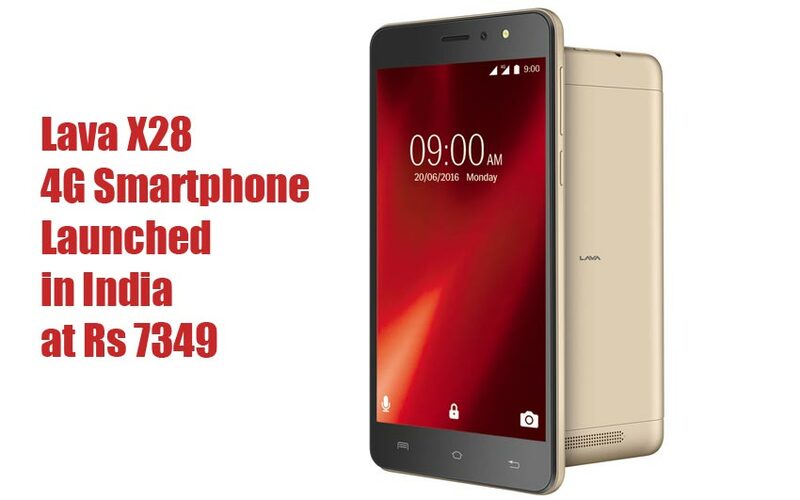 The Lava X28 price, Specifications, and features are given here in short. For More details, please visit the official website of Lava Mobiles. You can buy patterned, art, graphics, quote, metal phone cover online for your Lava smartphone. The latest release of Lava X28 4G smartphone had the price tag of Indian Rupee as 7,349. The new 4G smartphone under the affordable price is an exclusive for those who all planning to buy a phone Now. As per the report, the people can buy this smartphone via physical retail channels, multi-brand outlets, as well as online retailers. The phone designed with the big display as 5.5-inch (13.97 cm) HD IPS along with the resolution of 1280 x 720 pixels. The phone has made with the sports Corning Gorilla Glass. The screen pixel density is 267 ppi. It also consists of MediaTek processor along with the power of 1.3GHz quad-core. The users can get the RAM of 1GB and 8GB of internal memory storage. It has the capable to expand up to 64GB of memory storage of external by using the microSD card. Lava X28 Camera: The phone has the feature of 8MP rear camera with the autofocus and LED flashlight. The front facing camera has 5MP with 84-degree wide angle for video calling. The rear camera allows the users to record the 720p videos at 30FPS. Connectivity: The phone will arrive along with the box of the latest operating system, it is Android 6.0 Marshmallow. The phone has built with the Dual-SIM supports and 4G-LTE connectivity. The Newly arrived Reliance Jio offers has pushed the Indian People to buy the 4G supported smartphone. At this time, the Lava company introduced this phone to the market of India. So, the expected profit may reach as soon for the company. Most of the new arrivals has made with the battery power of 2600mAh along with the option of Power Saver mode. As like all other smartphones, this new Lava has also consisted with Accelerometer, G-Sensor, Auto Call Recording, Flip to Mute, Smart Gestures, Time Lapse Video, and Slow Motion Video. Also, it supported 4G-LTE, 2G/3G, GPRS/ EDGE, Wi-Fi, Wifi Hotspot for the network process. The users can also use the GPS facility by using this phone.